Patrik Nemeth has been assigned to the Texas Stars to rehab his arm laceration that he suffered in October with Dallas. He's not technically on a conditioning assignment, as he is still waiver-exempt, but that's basically what it is. He isn't expected to play more than three games, but there is a tiny possibility that he could play at home next weekend. Nemeth, of course, hasn't played for the Texas Stars since scoring the Cup-clinching overtime goal in St. John's last June. 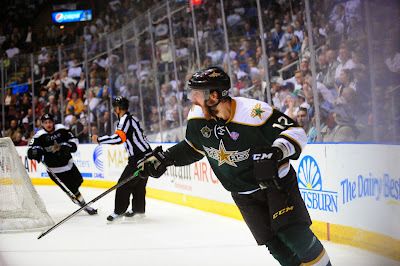 Dallas Stars General Manager Jim Nill announced today that the club has assigned defenseman Patrik Nemeth to the Texas Stars, Dallas' top development affiliate in the American Hockey League (AHL). Nemeth, 23, appeared in five games with Dallas, registering a +1 plus/minus rating and three shots on goal. The native of Stockholm, Sweden has missed the last 52 games after suffering an arm laceration on Oct. 18, 2014 against Philadelphia. The 6-foot-3, 230-pound defenseman was selected by Dallas in the second round (41st overall) of the 2010 NHL Draft.